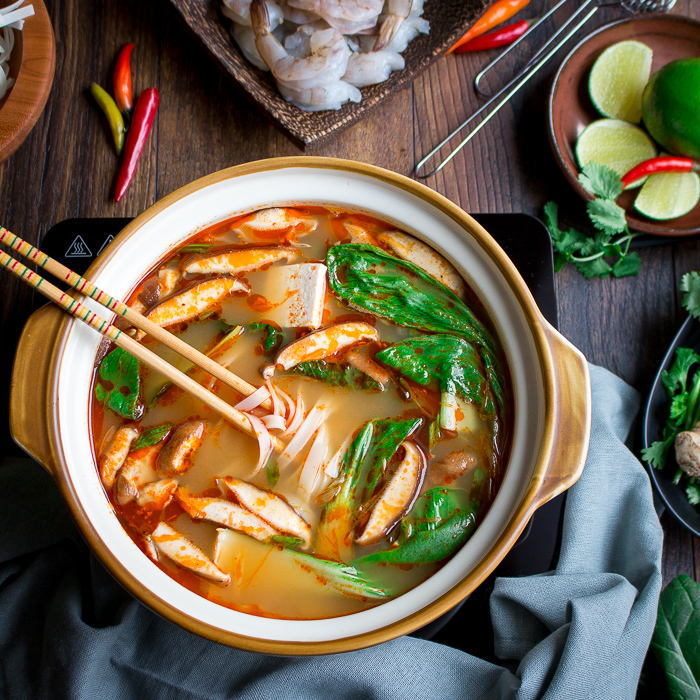 Simple Spicy Thai Hot Pot is an easy nourishing simmering pot of Thai spiced chicken bone broth served at the dining table allowing your guests to cook vegetables, seafood and noodles as part of a communal feast or individual soup bowls. There is nothing better on a cool day than sitting in front of a simmering pot of delicious broth. Do you like to watch, listen and feel the warmth coming in from a good crackling campfire? Watching your fresh vegetables, proteins and noodles dancing in the hot pot whilst they are cooking is sure to make you feel warm and cozy. One dip into the sauce for a spicy finish and a slurp of the nourishing broth and you well on your way to Hot Pot heaven. You are just going to love this Simple Spicy Thai Hot Pot because it is filled with warming spices and is super easy to prepare. This Simple Spicy Thai Hot Pot can be made as individual soup bowls. It is great way to refuel after a hard workout with plenty of nutrient rich leafy greens, omega fatty acid shrimp and anti-inflammatory spices. You can also prepare your Simple Spicy Thai Hot Pot as a communal feast and have your guests do all the cooking. In addition, we have used only ingredients that you can find at the regular grocery store. You got to love that! The temperatures are already dipping and it has been raining here all week. After all the years of living in Asia, our blood has gone thin. Have you ever been so cold that your fingers turn white? We are seriously chilled to the bone. When the temperatures drop, our family craves hot pot. 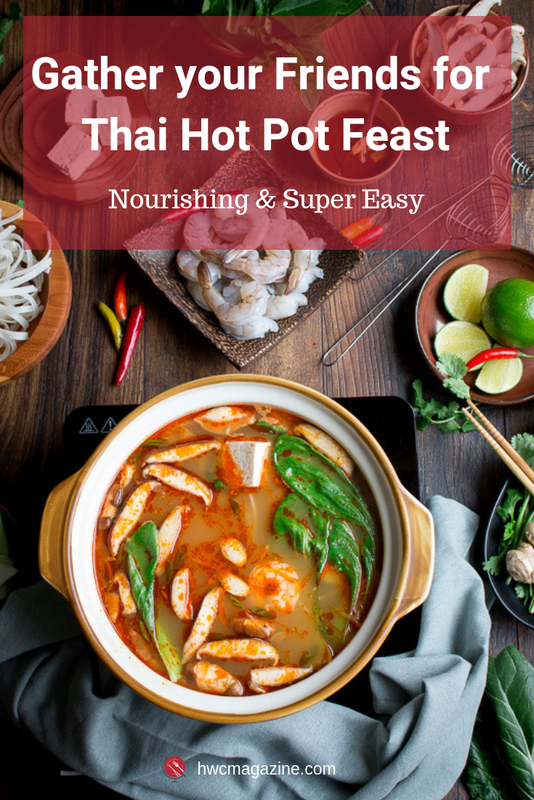 Simple Spicy Thai Hot Pot is just what you need to warm up from the inside out! Have you have ever had an Asian Hot Pot? Hot pot is referred to by many names such as “Thai Suki” in Thailand, “shabu shabu” in Japan, “huǒguō” in China or sometimes called Steamboat and other names. Essentially, the concept of each hot pot is the same. Spices, herbs and ingredients are added to the simmering broth. Then, family and friends gather around the kitchen table. Using either a hot pot cooker or a portable burner with a pot, you cook your own vegetables, proteins, noodles, fish balls, tofu, mushrooms and sometimes even egg. Almost always there is some type of dipping sauce. Please check out our Chinese Hot Pot Recipe for other hot pot ideas. 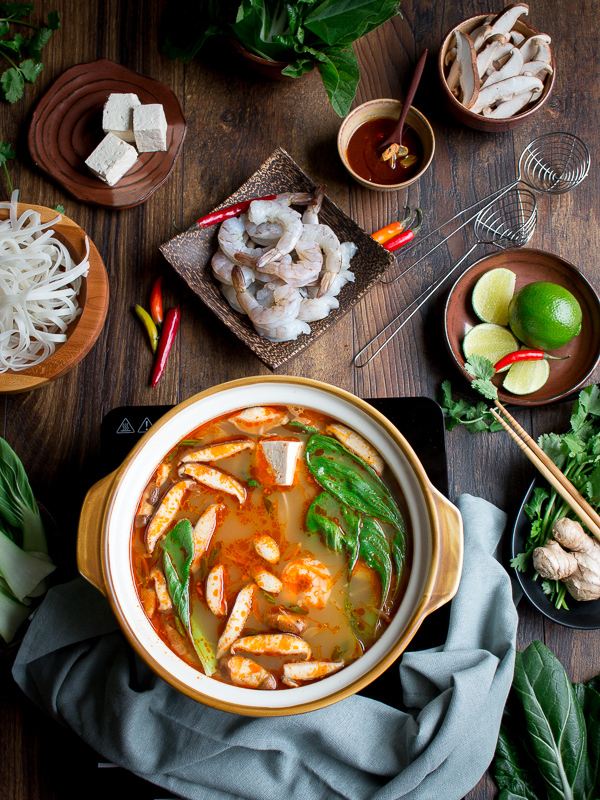 Why you need to make this Simple Spicy Thai Hot Pot at home! Cures what ails you with anti-inflammatory garlic, turmeric, ginger and chili. Thai Broth without all the fuss! Our grandmother used to make the BEST bone chicken bone broth. However, who has hours and hours to make their own bone broth from scratch. Pacific Foods Organic Chicken Bone Broth is made with organic free range chicken bones, onion, apple cider vinegar and spices and slow simmered for hours, so we don’t have to. We love the fact that each container of bone broth has just a few simple ingredients with no added salt and is free from additives like MSG. Bone broth can be used to deepen flavor and add nutrition in dishes featuring beans and grains, as well as soups, gravies or our Simple Spicy Thai Hot Pot. It is the cold and flu season friends. The best way is to prevent, rather than cure. Packing in lots of garlic, ginger, turmeric and chili in your hot pot will keep you warm and help give you that health boost to increase your immunity. This week were starting to feel under the weather with a scratchy throat, sneezing and tired so we made ourselves an Individual Simple Thai Hot Pot Soup Bowl. It is soothing on your sour throat and just what your body is craving to get back on recovery. If you want to make Simple Spicy Thai Hot Pot for just one person, just make it like a soup and serve. After you make the Thai broth, add in your veggie, proteins and noodles of choice and simmer for a couple of minutes and serve. It is simple as that! 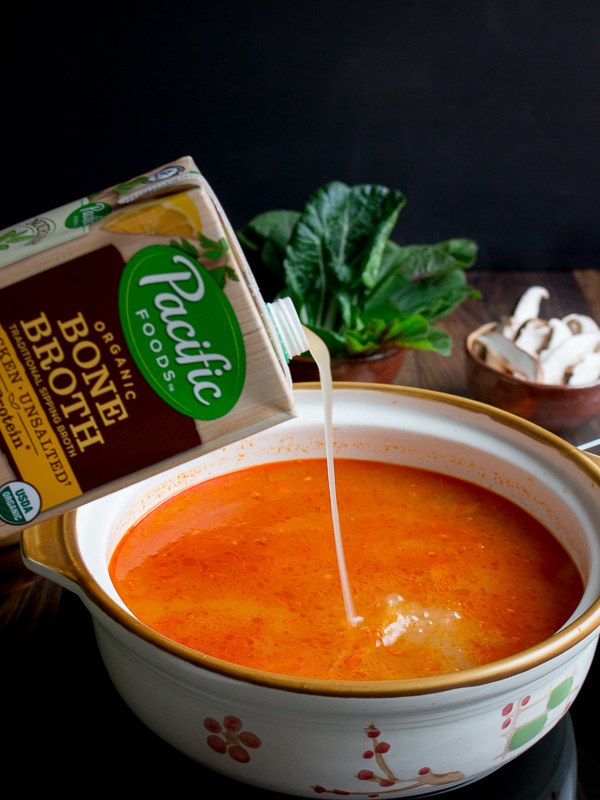 Did you know that for every 8 oz of Pacific Food’s Bone broth you will get 9 grams of natural occurring protein? That is more than a glass of milk with just 45 calories or less. The youngest in our family is a huge trail runner, even on those cold, wet and rainy days. Sipping warmed bone broth is a delicious way to recover post workout compared to sweet nutritional drinks, bars or yogurts. He has been heating up his bone broth before he heads up on his run and keeps it in an insulated mug for the ride home. In addition, Pacific Food's bone broth also comes in these convenient little 8 oz packages ready to heat and sip on the go. When it is cold outside, we also love a nourishing cup of bone broth to sip. Unlike caffeinated coffee and tea, we can drink bone broth any time of the day. We like to sprinkle in a little red pepper flakes and ginger. Have you ever tried bone broth? Please tell us what your favorite way to drink or use bone broth in the comment section below. Thai Cooking is all about the balance of four flavors; spicy, sour, sweet and savory. You can add any spices and herbs that your little heart desires. We wanted to make sure that you could find everything you needed easily at a regular grocery store. There is a nice balance of flavors with the fresh garlic, ginger, ground turmeric, red curry paste (spicy), Thai fish sauce (savory) and just a pinch of sweetener of choice (sweet). A little spritz of fresh lime juice (sour) just before serving is perfect. Do you have access to an Asian market? By all means, feel free to add kaffir lime leaves, lemon grass, galangal. If you do not have fish sauce, then you can salt and pepper to taste. You can add anything your little heart desires to the hot pot. However, everything must be sliced thinly and quick cooking vegetables work best. Harder vegetable should be placed in the hot pot first as they take longer to cook. 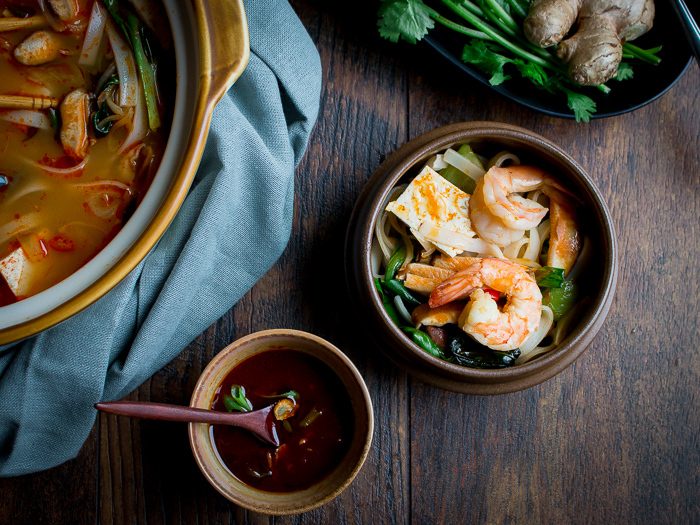 Noodles – We like to presoak our noodles for about 15 minutes so they don’t take so long to cook in the hot pot. If you want to serve hot pot as an interactive dining experience, all you need is a hot pot device or a single portable burner and a pot. 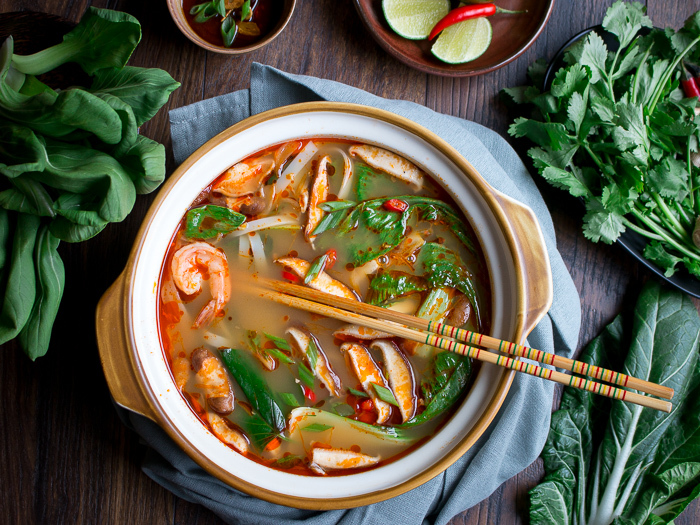 You can also make this recipe as delicious individual Simple Spicy Thai Hot Pot Soups and serve to the table already cooked. If you like Thai recipes, you may want to try our Creamy Thai Sweet Potato Soup, Tasty Thai curry Bowls or our Thai Sweet Chili Pork Tenderloin. Gather up cooking supplies for your family and friends such as tongs, long cooking chop sticks, strainers and such so they can drop in the items to be cooked and remove them when they are done cooking. If you like it spicy, we made a super simple dipping sauce with shriacha sauce, tamari (soy) sauce, sesame oil and lots of garlic of course. Fabulous to dip whatever you cooked in the hot pot in. 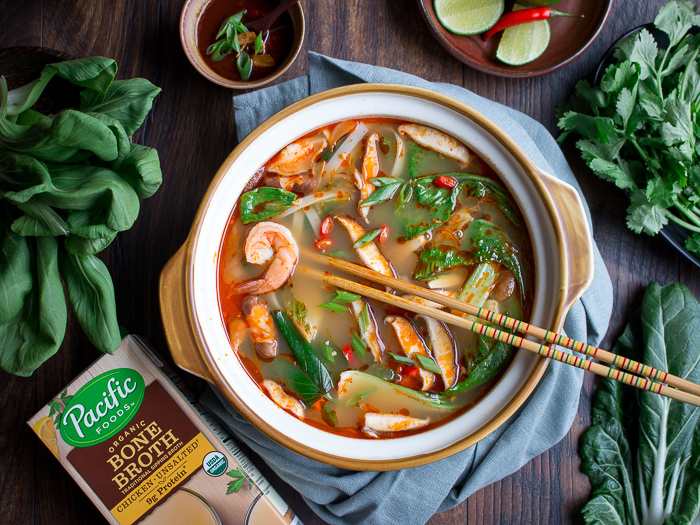 We love cooking up our noodles, shrimp and vegetables and then ladle some of that magical spicy Thai bone broth over the top. The broth is the best part and it really is just what our body was craving on this cold and damp week. We then squirt a little fresh lime juice on top and garnish with chopped green onions, cilantro and a little Thai chili, if you dare. You can make as much as little Thai broth as you need for one up to many people. The ratio of broth to ingredients depends on the size of your pot. We have a clay pot that holds about 6 cups of broth and this was perfect for 4 people. Please note that your broth will evaporate while cooking hot pot. We always end up adding the other half container of Pacific Food Organic Bone broth to top it off half way during the cooking process. Always, always, always cook your noodles very last or otherwise they will soak up all the liquid in your Simple Spicy Thai Hot Pot. Cook the hard vegetable first as they take longer to cook. Adding a little extra dash of red curry paste or chilis along the way to keep the broth spicy is always welcomed by the chili heads in our family. You can make your broth as mild or as spicy as you like to suit your preference. How can I make Simple Spicy Thai Hot Pot vegan or vegetarian? 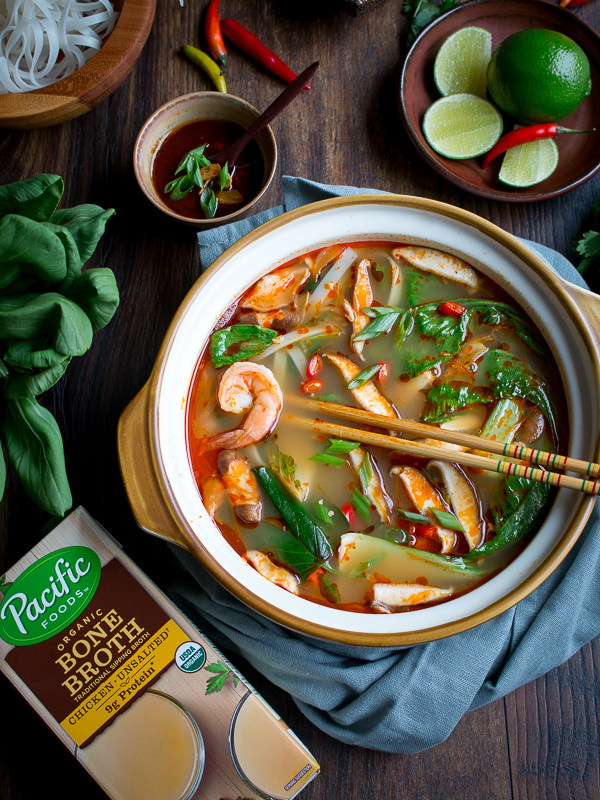 Pacific Foods offers a wide variety of organic products, including flavorful soups, broths and stocks, as well as a broad range of plant-based beverages on the market. We would use a mushroom stock or vegetarian stock to replace the bone broth to keep it vegan. In addition, use salt and pepper to season to taste and exclude the fish sauce. Pack in the mushrooms, vegetarian dumplings, tofu and lots of leafy greens for a delicious bowl of comfort food. This post is in partnership with Pacific Foods®. As always, all opinions are our own. 1Heat up hot pot device, portable burner with pot or can also heat up burner on stove top for individual soup bowls. Add olive oil, garlic, ginger, turmeric and red curry paste and cook until aromatic and the oils from curry paste start to separate, about 2 minutes. Add Pacific Foods Organic Chicken Bone Broth, fish sauce and sugar or sugar alternative stir and allow soup to simmer over low heat for 15-20 minutes. 2While your broth is simmering, prepare your hot pot additions. Soak your rice noodles in tepid water for about 15 minutes. Peel and devein your shrimp. Drain and cut up your tofu into cubes. Wash your baby bok choy and separate from stalk. Prepare your vegetables. Slice your mushrooms. (Feel free to use any proteins, vegetable or even dumplings or eggs. Make sure you slice any beef, pork or chicken super thin so they cook quickly.) Gather up your cooking utensils such as cooking thongs, cooking chopsticks, slotted spoons for your guests. Place all your prepared hot pot ingredients in small bowls and dishes around the table so that guests can help themselves. 3Make your Hot Pot Dipping Sauce (optional) - In a small bowl mix Sriracha sauce, Tamari (soy) sauce, lime juice, sesame oil, garlic and pinch of sugar. Stir well and set on the kitchen serving table with your other hot pot ingredients. 4Hot Pot – Communal Feast Option. Confirm that the hot pot is set to medium heat and a light boil. Invite guests to cook the firmer vegetable first in the hot pot, followed by shrimp, tofu, leafy vegetables. These items only need 1-2 minutes to cook in the hot pot and then they can be removed and eaten. Enjoy with a little of the Thai Hot Pot dipping sauce if desired. You will most likely will need to add another 8 ounces of the Pacific Food Organic Chicken Bone broth to the hot pot as some of the broth will evaporate during the cooking process. When everyone has had their fill of vegetables and protein, cook the noodles for the group. They should only take a couple of minutes, if you have pre-soaked them. If you have not pre-soaked your pad Thai rice noodles, follow the direction on the noodle package for cooking times. Serve cooked noodles into separate bowls with a ladle of that delicious broth, a spritz of lime and top with cilantro, green onions and chilis if desired. 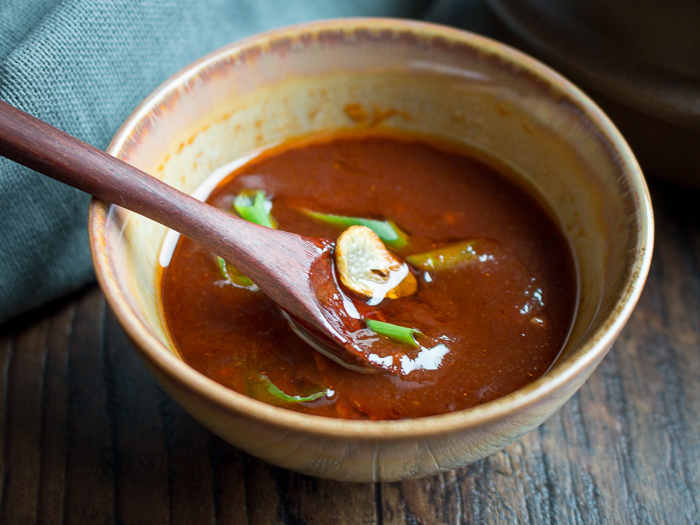 If you like it extra spicy, add a little drizzle of the Thai Hot Pot Dipping Sauce. Enjoy! 5Individual Bowl Option: Turn your stove top burner to medium heat and confirm you have a light boil. Add your shitake mushrooms first to the prepared Thai Broth and let cook for 3 minutes. Add your shrimp, tofu, baby bok choy, pre- soaked pad Thai Noodles and cook for about 2-3 minutes. 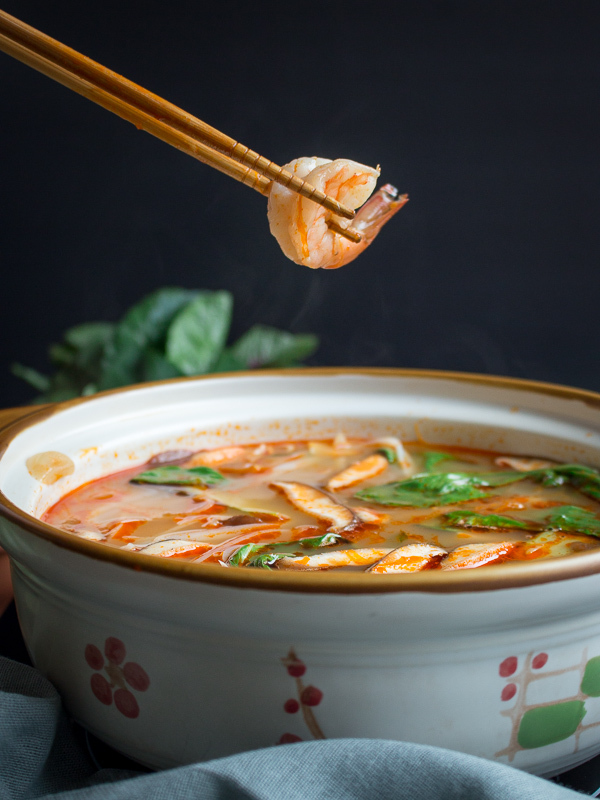 Place your raw spinach on the bottom of each of your serving bowl (no need to cook as when the hot broth is poured over it will cook right in the bowl) Place a scoop of noodles, ladle of Thai broth, cooked shrimp, tofu, mushrooms and baby bok choy in the bowl. Drizzle with a little squeeze of fresh lime juice. Garnish with cilantro, green onions and a little of the Thai Hot Pot Sauce, if desired. Enjoy!